The Greek economy contracted by 6.9% in 2011 according to preliminary statistics by the Greek Statistical Agency, bringing the gross domestic product (GDP) down to almost 2003 levels. 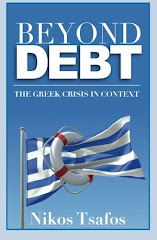 At the same time, the Greek Ministry of Finance has published its first estimates for the consolidated budget in 2011. According to the figures, the budget deficit actually rose in 2011 due to a slower decline in expenditures versus 2010 and a large decline in revenues. These numbers underscore the futile effort to draw more money from a contracting economy to pay for a state that is not shrinking quickly enough. In 2010, the government made progress in reducing its budget deficit: revenues rose by €1.7 bn as higher taxes offset the decline in receipts that comes from a recession. Spending also fell by €10.4 bn despite a €1.3 bn increase in interest payments, meaning that primary spending was cut by €11.7 bn. 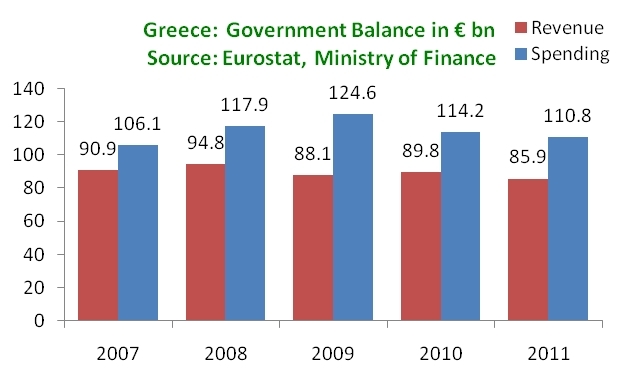 Thus, the budget deficit declined from €36.6 bn in 2009 to €24.5 bn in 2010. This progress, however, fizzled in 2011 as the consolidation effort moved past the “low hanging fruit.” Revenues plummeted by €3.8 bn and reached their lowest point since 2007. Spending, on the other hand, did fall, but only by €3.4 bn. Since interest payments once again rose by €3.1 bn, the decline in primary spending was €6.6 bn, which is notable, but almost half the decline in 2010. As a result, the budget deficit rose by €0.4 bn to 11.6% of GDP versus 10.8% in 2010. The effect of this consolidation has been to plunge the economy in a deeper recession. The economy contracted by 6.9% in 2011 (versus 3.5% in 2010 and 3.3% in 2009). Yet the composition of this recession has changed (see here). Throughout 2009 to 2011, there has been a steady reduction in imports (M), which acts as “growth” for GDP. Contrary to news reports which tout an export boom in the country, exports (X) contributed modestly to GDP in 2010 and they were flat in 2011. Investment (I) has been declining since 2008 – not only is investment now 50% down from its 2007 peak, but it has fallen below 2000 levels. Government expenditures (G, which only capture a share of total spending) also declined in 2010 and 2011. The big problem, however, is consumption, which fell by 7.1% and which was, by far, the biggest driver of the 2011 recession. These numbers show that despite some progress in shrinking the state in 2010, government spending is not falling enough. Instead of making a more serious effort to roll back the state, the government is trying to increase revenues – but since it is unable to raise revenues by fighting tax evasion, it is doing so by raising taxes on everyone. This, in turn, is squeezing money from households (which can’t spend) and from companies (who can’t invest) causing an ever deepening recession. To get out of this vicious cycle, Greece needs a more serious effort to cut government spending. If spending is lower, then the government can achieve its budget deficit targets with a lower level of taxation, meaning it can lower taxes on households and companies. Such tax relief is essential to reignite spending and resuscitate a moribund economy. Greece’s big state is literally squeezing the life out of the economy. I love your posts. I find them indispensable to following this very important development. If I might make a suggestion -- it would be interesting to me if you could discuss the views that differ from yours. What other perspectives do you respect as being at least honest efforts to wrestle with the problem and what are your views of those other opinions?? Thank you Fred - much appreciated. As for your suggestion, I do try from time to time to address an emerging consensus or a strong point of view. But I also think that an overwhelming majority of what is written on the Greek crisis is inadequate. I often find that there are points of view out there that agree with certain aspects of what I am describing here but not the whole thing. But will try to be more explicit in responding to specific ideas. Speaking from a personal view, I couldn't agree more. I have a small business here in Greece, which against all the odds, has increased turnover more than 60% in the last four years. However, I'm actually worse off than I was when I started in terms of disposable income because of the rises in taxes, pension contributions, VAT and the price of petrol. Combine this with uncertainty, and the fact that the money I do make stays in the bank and it makes it difficult to believe that things will get better without a determined attempt to do the things outlined by the author. I don't think that we'll see a smaller state sector because there is no will. There are finally some considerations to shrink government ministries and cut off those parts which were only created to buy votes, without any purpose. But one has to wonder: Why haven't they started to do that when the crisis broke out? And I doubt very much that they will do it anyway. At the same time, Greece was offered help to build a business development bank to avoid the problems you mentioned: insufficient access to credits for small and medium sized firms. Greece refused to take the offer. It's just unbelievable, isn't it?! Why do you talk about the Greek state when this is all Merkel's doing? Merkel has subcontracted the Troika to do her dirty job and the Troika in fact is doing things that not even the Troika believes in. 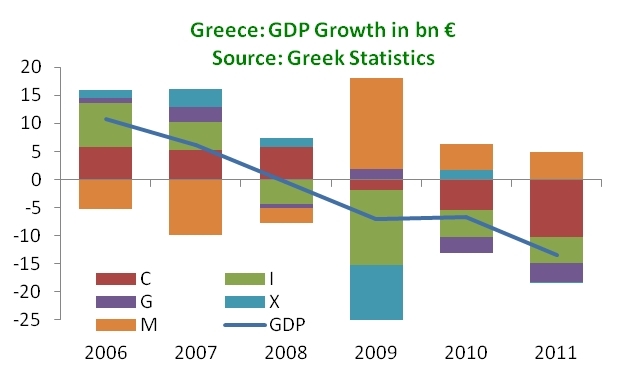 Don't tell me that the Greek state is in its 5th year of recession because of the refusal to cut government spending! This is all about an austerity package, made in Germany, that has failed with a thud! Go ahead, dismiss the whole government and see if things improve. BTW, the formula is: GDP = C + I + G + (X-M). With C(consumption) down, I (investment) down and X-M (balance of trade) stuck in the negative, how can you say that G (government spending) should go down also? It's o.k. to have your private opinions but talking nonsense really dos not help. What you are promoting is against elementary economics. G should go down because G grabs directly from C. The latest tax increases have been outrageous and have sent C down sharply as you can see in the second graph. "It's o.k. to have your private opinions but talking nonsense really dos not help. What you are promoting is against elementary economics." And what you are promoting is against elementary common sense. I don't suffer fools very well. The comment right below your name was meant as an answer to your observation. I read that absorbing more EU funds, credits from the European investment bank and even from the German KfW are a big topic in Greece today to boost investments. I also know that the task force is in Greece since more than a year to help absorbing EU fonds. All this sounds very weird to me. Why does it take so long to apply for these fonds or for a credit from such a bank? Do you know the criteria? I fully agree with your article. A combination of spending cuts and reasonable investments could be the cure for Greece. Further tax hikes must be avoided, they are poison. But I also think that there has to be a change in the political culture, especially regarding corruption and some laws which protect politicians too much.